I had just finished my 5th standard. During the school holidays, we shifted to our new house address: A-1-16, Priyadarshini Nagar, Makarpura Road, Baroda. There was a large tempo that carried our household items from the old address, 108, Vithlesh apartment. Our new house was a 2-floor duplex, with a small garden that grew roses, jasmine, papaya, pomegranate, and passion fruit. Amma was passionate about gardening. 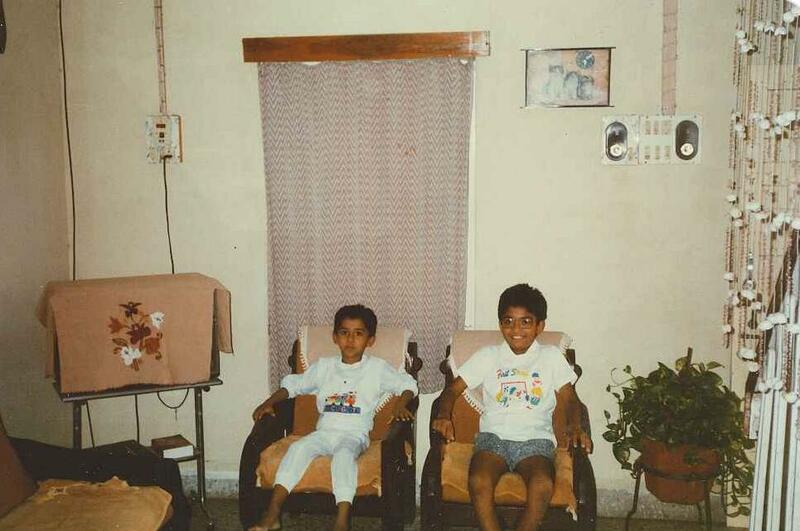 I had enjoyed my childhood days at Vithlesh apartment and had a large troop of friends, who were of the same age group. We were all avid cricket players and dreamed of playing for the Indian cricket team when we grew big. Our heroes were Kapil Dev, Sunil Gavaskar, Srikanth. We lived in the Priyadarshini colony for the next 17 years, from 1988 to 2005 with wonderful neighbours who became an integral part of our family. I remember the construction work at the Priyadarshini Nagar. Ashish, Vivek, and I used to visit, to see the construction of our new house. It was a picnic for us to travel all the way from Vithlesh apartment. I used to sit on Ashish’s cycle as he rode. We used to have samosas from the Gopal store. It was a rare delicacy for me in those days. Near to our colony were Don Bosco, Auxilium Convent, Bhavans, Mother Teresa ashram, Mount Carmel Church, Sussen Textile Mills, Novina Batteries, GIDC industrial estate. After moving to Priyadarshini Nagar, in the beginning, we had a Parsi and Bengali neighbours for the first two years. Later they left and we had malayalee neighbours – Uthup uncle and family, Sudevan uncle and family, Sudhakaran uncle and family. Occasionally, we used to go to the Jacobite Church at the Don Bosco school since it was near to our house. It was torture for me to attend the prayer service as I was not able to understand the language. I remember an incident while playing cricket with a neighbour friend; I broke the car headlights. After that incident, I stopped playing cricket in front of the house. I liked the Parsi’s food preparation; it was tasty. After they finished the tenure of their rent, Uthup Uncle and family lived there. We used to play cards, caroms, and monopoly during the Diwali/school holidays. In the evening, I used to play cricket with the colony friends. Occasionally, mom and I used to visit the Vithlesh apartment while Dolly’s family were still there. It was fun to be with my old friends – Kunjan, Jigar, and Nilesh. We played cricket whenever we got a chance. I had once scored low marks in Gujarati language. My mother had asked if I came to know about Gujarati marks. Out of fear, I said no. I wanted her to know the score during the parent-teacher meeting. But when we went to Vithlesh apt, my mother came to know that Gujarati marks were already released and I had hid from her. Although, I had managed to pass but it was not a good score like other subjects where I scored well. During my 6th std, I got a new bicycle. Ashish rode it all the way from the shop to our house. The tyre got punctured when it reached home. Dad and I took the cycle next day evening to repair the tyre. My school was a bit far from our new house. An auto rickshaw used to take me and my brother along with other kids. I think there were about eight school kids in that rickshaw. After 7th, I moved to Shreyas Vidyalaya, Samarpan at the Manjalpur road. The new school was near to our new house. I used to take a public bus and sometimes bicycle to school. By this time, the Bengali neighbours left, and the new neighbours came in – all Keralites. I remember my first day in the 8th std. It was a different environment with new friends, new teachers, and new location. When the teachers were absent or didn’t show up for teaching, we used to go down and play cricket. The school walls were scribbled with names of some of the teachers students disliked or made fun of such as babu, mammu. It was in 1990 when I was studying in the eighth standard; the school was impacted by the Mandal Commission. The newspapers carried reports of self-immolation in protest against the reservation system implemented by the V.P Singh government. We had long holidays. Deepak and I used to do combine study during that time. English was my favourite subject. I remember my struggle with understanding the chemical equations. Sussen chechi, my cousin sister, who was doing her MA, helped me understand the molecular formulas. She stayed in the hostel and used to visit us during the weekends. I remember playing cards with our neighbours during Diwali holidays. Mom and ladies from the neighbourhood would gather every evening. During Christmas, our house was flooded with guests. Mom prepared cakes and other eateries before Christmas. During the Good Friday, we used to go to a Jacobite Church at the Basil School, Old Padra Road, and be there from morning till evening. It ended with delicious serving of rice porriidge, payar, mango pickle, and pappadam. I remember watching Ramayana, Mahabharata, Tipu Sultan on the Doordarshan channel, Sunday mornings. We had a house maid who used to come daily for cleaning and washing. The vegetable sellers would pass by our house in the morning. We used to buy rice, dals, masala powders, and snacks from the Gopal store. During the eighth standard school vacation, 1991 we went to Kerala. It was during that time; Rajiv Gandhi was assassinated. I was at my dad’s place when this happened. In the 9th std, I had maths tuition. At school, Navle madam taught maths, English was taught by P.G. Bhatt, and Sanskrit by Kalpana madam. Every week, we had to speak on some topic during our English class. I spoke about “Empowering Women at the Work Place”. We also had Drawing as one of the subjects. Gaekwad sir used to take the Drawing class. I was never good at drawing. In X, I enrolled at the Vinayak tuition at Anandbaug. We had Typing as one of the subjects. I used to practice on a Remington typewriter. Life in X was all about attending school, tuitions, and study. In the first term exam, I scored well but in the second term, my rank slipped. During the last few months before the board exam, dad helped me prepare for exams. He used to take tests frequently. During this time, P.V. Narasimha Rao was the prime minister of India. I remember the day I appeared for the X board exam. The first paper was English, which I did well. The second paper was Maths; it was difficult for me. The rest of the papers were relatively easy. After the examination, we went for holidays to Kottayam. When we returned Baroda, the results were declared. I scored overall 75% by God’s grace. The marks that I scored in each subject were exactly that I had prayed for. In XI, we had Hussein sir who taught English; Saffi madam taught Chemistry, Pandya sir taught Maths. I used to go on cycle for Maths tuition at Pandya sir’s place. I remember attending the physics, chemistry and biology laboratory in the school. We had to submit practical books every week. Sarah chechi stayed with us for her MA during my XI and XII. Biju Chetan also stayed with us during my XI. After his marriage, they rented a flat at Mangal Murthi. I loved Renu aunty’s biryani. In XII, life was chaotic. Every day I had one or two tuitions – Physics, Chemistry, Maths, Biology, all at different places. On early Sunday mornings, I had practical tuitions for Chemistry, Biology, and Physics. I used to go on bicycle everywhere. After tuitions, I would be dozing off during the study time. Some days, I would leave the school early to prepare for the tuition exams. Time was precious. In spite of my best efforts, I did not perform well in the school and tuition exams. Biju Chetan helped me in the Biology practicals by drawing diagrams for me. During the board exam, Appa used to come with me to the examination venue. By God’s favor, I performed better in the final year board exam than the tuition or preliminary school exams. It’s a miracle that I scored 62%. Without God’s favor, I would have definitely failed. But I was disappointed for not getting a seat in the Engineering or Medicine.